Accelerate your leadership and career growth. Leadership Coaching helps you achieve your goals, increase your executive presence and demonstrate greater leadership impact. Create significant, sustained behaviour change that increases your leadership success. Choose from a range of executive coaching programs to suit your level of experience, your needs, and your schedule. Karen is accredited in the Marshall Goldsmith Stakeholder Centered Coaching methodology, which can be used to structure your coaching program. I first met Karen Morley at a time I was having difficulty with a number of work interactions. I was recently appointed into a senior role to develop a new team and desperately wanted to be successful. However I found myself struggling to connect with the team, find acceptance with my new peers and couldn’t understand my boss’s responses. My toolbox from prior executive coaching was failing me and I knew I needed a different approach. On meeting Karen I realised I had found the difference. Karen focussed on me, the individual. Not me the co-worker or employee. For the first time I learnt to see how my beliefs, vulnerabilities, successes impacted how I responded to others within the work environment. Karen lifted me out of the details of the situation and helped me observe myself. I finally appreciated one’s work success is not just about the technical skills and delivery but is truly influenced by connectivity and how each person creates the connections. That “light bulb” moment was transformative and I believe was fundamental to my growth as a leader. It is an insight I try to pass on to others. 1. Assess and reflect on your leadership strengths and gaps, appetite for change, motivations, values and context. 2. Deepen your insight into your leadership identity, and what challenges you most. 3. Become a more mindful leader. Act on your intentions. Increase your authority. Stay authentic. Review and recalibrate on an ongoing basis. 4. Increase executive presence. Be more mindful, more balanced and more powerful. Be prepared for the next challenge, promotion or organisation change. Fulfill your potential. Make the first 90 days in a new role count. Create success. Achieve higher levels of performance and maintain engagement and morale through effective team leadership. Deliver maximum impact. Increase executive presence. Be more mindful, more balanced and more powerful. Karen has coached/coaches executives at AICD, Allens, BHP Billiton, CBA, Coles, CSL, CUB, Downer, GCC, ExxonMobil, KPMG, Latitude Financial, Lendlease, L’Oreal, Lumleys, Medibank, Melbourne Airport, Melbourne Water, Monash Health, Officeworks, Orica, RACV, Rural Finance, Target, UGL, University of Melbourne, VisionStream and Wesfarmers. 10/10: Leadership coaching helped me increase my effectiveness as a leader. There was the right balance between challenge and support in achieving my goals. Karen helped me significantly build my emotional intelligence. She was a breakthrough for me in building my confidence and identifying key leadership development areas. Karen gave me a number of very useful techniques that enabled me to maintain my objectivity and my equilibrium at a very challenging time. Central to the process was a focus on clarifying my values: the process she led me through was beneficial in understanding my core values that would continue to guide me, and the new and changing values that were driving a re-orientation. Overall leadership coaching was tremendously positive. I have made significant progress as a leader, a view supported by feedback from my key stakeholders. From the first session, the chemistry was right and Karen very quickly became familiar with me and my role. 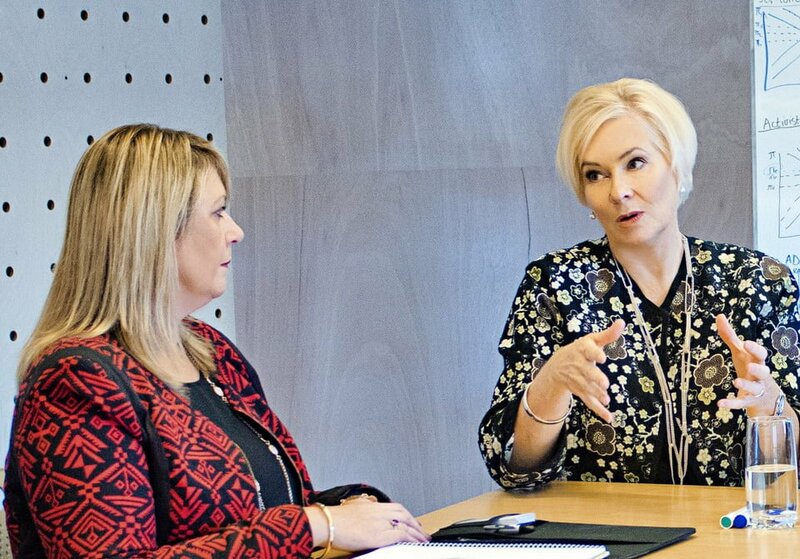 Meetings with Karen have provided the guidance and solid structure around which to reflect and formulate development plans with clear actions and outcomes. Karen has also assisted me in navigating through a period of uncertainty. Karen’s background as a psychologist and her enormous experience of business life enables her to be an insightful coach to senior executives. Her ability to move between the micro and the macro is outstanding. Face to face coaching takes place over six to twelve months, through regular confidential and reflective conversations. Explore your challenges, concerns and opportunities. Identify practical, everyday actions that will make a big difference to how you lead. Call or email me to discuss how a coaching program can help you achieve your goals. For individuals who want a coaching boost and who are self-funding, a Coaching Starter Kit is available for $3,000 + GST. Plus, you’ll receive a complimentary copy of Lead Like a Coach, which will help give you insight into how you can support your own continuing development. What would you like to achieve from coaching?